The commercial signs of yesteryear, which were all painted by hand, offer a kind of beauty, personality, and longevity that today’s industrial signs have been unable to duplicate. While exploring what’s left of the old sign-painting traditions, we stumbled upon small but lively seeds of revival. Bob Dewhurst has been painting signs by hand since the 1970s, authoring many of the iconic images that came out of San Francisco's Haight Ashbury district, made famous by the hippie era's Summer of Love. He works out of a collection of old trailers in what's left of San Francisco's industrial district. Signs are everywhere—on streets, storefronts, billboards, even city buses. They’re so ubiquitous, so overwhelming, that we do our best to render them invisible. But we can’t. Signs are designed to catch our eyes; as such, they shape much of the aesthetic character of our cities and landscapes, creating a visual archeology of where we live. Older signs in particular have a certain staying power. Hand-painted with a permanence that outlasts their original commercial messages, they tell a story of a bygone era. Each decade, and each region, has its own look and feel: Ouija board fonts, bold black enamel letters, winking cartoon characters, jazzy cut-outs, bubbles and stars, curlicues and winding flowers, or sleek, minimal designs. At their best, signs elevate the ordinary–the name of a grocery store or shoe repair shop–to the beautiful, suggesting uncommon taste and attention to detail within. Today, there is only one trade school left in the U.S. for sign painting: the Los Angeles Trade Technical College. Some of those signs have managed to linger past their time, providing a layered history of commerce and style. Along rural highways and in what’s left of old industrial cities, barns and brick buildings are still adorned with “ghost signs”—faded letters bearing the names of companies and merchandise from decades past. These ghost signs still whisper yesterday’s gentle sales pitches, in stark contrast to the marketing norm of today—big, blocky lettering on banners and billboards that are industrially produced, calling for attention with bold but lifeless uniformity. Within only a few years, these inexpensive plastic banners often slump and tatter, and end up thrown in the trash. In an alley behind San Francisco’s glimmering new Museum of Modern Art, remnants of the city’s once gritty, commercial past can still be glimpsed in a “ghost sign” advertising a flag factory long since closed. As in so many industries, technological advances—in this case, computers that reduce cost, time, and need for human skill—drove the artistry out of the sign business. Today, there is only one trade school left in the U.S. for sign painting: the Los Angeles Trade Technical College. Yet, as often happens at the moment when people realize that an old craft is dying, there is renewed interest in bringing back the hand-painted sign, mostly among a younger generation that brings different skills and aesthetics to the craft. Anyone pawing through collections of old posters for rock concerts from the 1960s will run across lettering with this aesthetic. Like most everything else in that era’s pop culture, signs like this signified, quite literally, that generation’s sharp—and very experimental—break from the past. 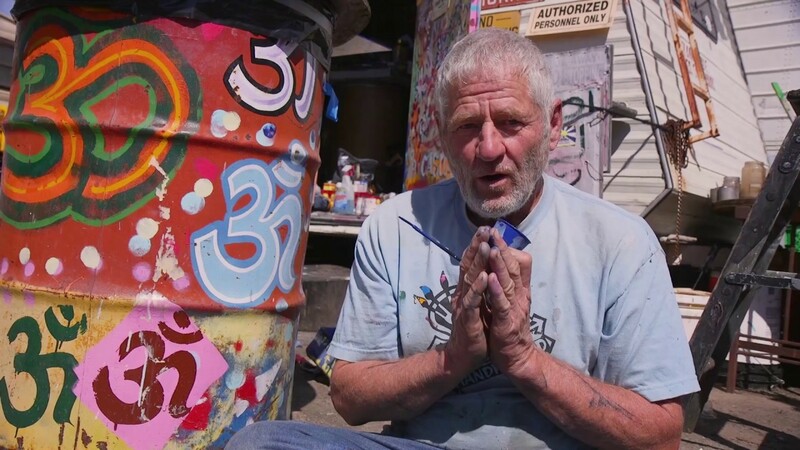 Bob Dewhurst, one of the nation’s few veteran sign painters, lives in a cluster of beat-up trailers behind a warehouse in the fast-shrinking industrial section of San Francisco. An old turquoise truck is parked out front, with “HAND PAINTED SIGNS” in large, cheerful lettering on the side. A sign on his trailer, which notes that Dewhurst is available by appointment only, warns visitors, “No Loitering, No Lurking, No Skulking.” Dewhurst, a weathered and spattered character in a faded sky-blue T-shirt, is lettering a piece of wood on a table when I arrive. His brushstrokes are as tidy and clean as his surroundings are chaotic and messy. After greeting me, he glances around him at his collection of signs. For years, I’ve seen Dewhurst’s signs almost every single day in my neighborhood—the Haight-Ashbury, which was the epicenter of the hippie era’s Summer of Love. I barely noticed them as anything other than names. When I now study these signs, I see they all have personality—a suggestion of magic and altered states—which still forms a large part of the Haight’s character. Paging through Dewhurst’s notebook, I recognize several signs from my neighborhood, the Haight-Ashbury, a district of San Francisco made legendary 50 years ago, as the epicenter for the hippie Summer of Love. I realize that Dewhurst created the swirling, psychedelic sign on the Pipe Dreams head shop, along with images for a pizza parlor, a vintage clothing store, and a bagel shop that has long since closed. For years, I’ve seen Dewhurst’s signs almost every single day and barely noticed them as anything other than names, at least not consciously. When I now study these signs, I see they all have personality—a suggestion of magic and altered states—which forms a large part of the Haight’s character. Dewhurst tells me that he used to be able to walk around town and spot who made which sign, because each painter’s style is a little different. Painting a sign by hand might seem relatively simple, but mastering the variety of lettering styles—and the art of precise lines and spacing—requires months of mind-numbing practice. If you visit one of the sign painting shops that are opening up again, you will often find an apprentice standing at a wall, repeating the same strokes over and over. A lot of small businesses are now interested in the appeal of hand-made signs. Even large businesses and corporations are starting to commission them, a trend that might help Bob Dewhurst’s company, Sign Language. Once upon a time, of course, all signs were hand-painted, even on billboards. In some ways, the trade launched an especially American craft, geared to our vast spaces, unbridled commercial enthusiasm, and limitless appetite for advertising. Consider the work of Clark Byers, dubbed the “barnyard Rembrandt.” Byers painted “SEE ROCK CITY,” a roadside attraction outside Chattanooga, on the sides of more than 900 barns in Tennessee and Georgia before he died in 2004. Despite the small scale of most sign painting operations (this is Dewhurst’s back office, so to speak), the revival of sign painting has became so widespread that, in 2010, filmmakers Faythe Levine and Sam Macon made a documentary and accompanying book about many of the characters in the industry across the country, called Sign Painters. The film was released in 2013. In those days, sign painting was a real trade, where someone with some art skills, or who at least had enough patience to learn to draw a straight line, could go to trade school, apprentice for a few years, and end up working a union job handling ropes, ladders, and scaffolding with maybe 40 other sign painters in a big city like Chicago or Boston. The profession had strict rules: students had to master specific types of strokes, spacing, design, and styles, along with the special techniques required to transfer small drawings onto the sides of very large buildings. Then, in the 1980s, computers were developed that could churn out signs in a variety of stock fonts, which were then printed on vinyl—fast, easy, cheap, and anonymous. When my husband wanted the hand painted sign on his company’s brick building a few years ago, he first sought a proposal from New Bohemia Signs, a small revivalist sign-painting shop founded in San Francisco in the 1990s. New Bohemia bid $3000 for a two-color six-by-thirty-foot sign, which had to be primed on the brick; the vinyl banner they ended up with cost far less—about $1000 with installation—but it has already been replaced once. “Digital printing these days might be a little less expensive, but you end up with something that doesn’t last as long or weather as well,” says Damon Styker of New Bohemia. But in today’s economy, short term savings almost always beat long-term costs. When large computerized signs became available, most sign painters went out of business. “Vinyl came in and nearly decimated the sign industry,” says Kasabian. Those who kept painting were, like Dewhurst, more lone wolves than union men. “It’s nearly impossible these days to make a living off sign painting,” says Kasabian. Anthony’s Shoe Service on Kearny Street in downtown San Francisco, is one of the nation’s most highly rated shoe repair shops. When Mario and Gino Gentile bought it, they wanted a sign reminiscent of their father Serafino Gentile’s old shop in Vancouver, British Columbia. So they brought in Damon Styer of New Bohemian Signs to do the job. As it happens, some of those graffiti artists, armed with a new level of education and determination, are re-invigorating the tradition of sign painting in Los Angeles. That revival is mostly thanks to Ralph “Doc” Guthrie, who teaches “Sign Graphics” at Los Angeles Trade Technical College, the lone sign-painting trade school. Guthrie’s students come from a variety of backgrounds, and Guthrie has found that some of his best were street graffiti artists and “taggers” (once they mustered some discipline). Guthrie, himself a 1972 graduate of the program, worked as a sign painter for years, and therefore understands the patience and perseverance needed to master a craft. He starts the students off with mind-numbingly dull exercises painting brushstrokes and charts, until they develop muscle memory and speed. The second year is more fun, where students do drop shadows, gold leafing, shading, and a wide variety of lettering styles. “He’s hella strict,” Jorge Velasquez told the L.A. Weekly. Velasquez went from being a graffiti artist to painting signs for Trader Joe’s. Other graduates have found apprenticeships (a vital but disappearing tradition in itself) and then set up their own shops. Sign painting’s renewed popularity nationwide started in the 1990s, with the DIY movement and a generation that was keen on reviving other analog media and artisanal crafts, such as celluloid film, vinyl music records, and handmade wallets. “Everything is so digital and screen-oriented that people need a reprieve,” says Kasabian. “Having something handmade reminds you that you’re a human.” Kasabian’s sentiment seems to be spreading. New sign painting boutiques are now popping up in hipster neighborhoods in cities such as San Francisco, Portland, Austin, and anywhere there’s an interest in reviving old-time aesthetics or creating fresh new styles. Unlike the previous generation of sign painters, many of these DIY enthusiasts were educated in fine arts or worked as graphic artists first. New Bohemia Signs, in San Francisco, was the first of the new generation of sign-painting shops. It was started in 1992 by Steve Karbo, who soon after partnered with Yvette Rutledge. They left to found Mystic Blue Signs in New Orleans, and a former apprentice and art school graduate, Damon Styer (above left), took over the shop. Many of the nation’s younger generation of sign painters have apprenticed at New Bohemia, including Caitlyn Galloway (above right). The shop’s influence helped make San Francisco the epicenter of sign-painting’s revival. These new shops are not only bringing back an old commercial art form, they’re also providing new work, and badly needed teaching jobs, for senior sign painters. Colt Bowden, 32, an Oregon-based sign painter, has gathered techniques from many of these older painters in a series of self-published, retro-style booklets entitled “How to Paint Signs and Influence People.” The booklets have helped revive some old lettering styles, such as Roman, Egyptian, casual, speed, script, and icy caps. An enthusiasm for DIY projects only gets people so far in sign painting, because careful design and lettering, especially when it’s blown up onto building walls, requires serious skills. At one point, Bob Dewhurst showed me how to begin a large-scale sign by using a “pounce pattern”—the same technique Michelangelo used to transfer his small drawings to the ceiling of the Sistine Chapel. When the company chose the cheaper digital approach, they sent its logo to an industrial shop that printed the lettering onto heavy PVC vinyl, the way your computer tells your printer to make a color image. The useful life of such a banner is three to five years. The process starts with a small drawing of the design on graph paper. Dewhurst scales that up by re-drawing the design in each small square on another sheet with much bigger squares. Working square by square, he ultimately recreates the design at full scale. Other times, to produce an exact replica of a drawing such as a logo, he uses a simple projector to enlarge the image onto a piece of paper taped to the side of his trailer. Once the design is outlined, Dewhurst uses a pounce wheel—which is like a little pizza cutter that makes holes—to trace the lines of the design. Then he rubs chalk or charcoal over the pounce paper, which transfers the design to the sign behind. After removing the paper, he begins painting from the middle of the letters, working outward, adding embellishments, shadows, and pin-striping. He keeps these pounce patterns, because they can be used over again. What’s the difference between these signs and today’s computerized version? Consider the banner for my husband’s retail building. For sign painters, the pounce system would guide their paint job on a brick wall, where the lettering would eventually fade but still be visible for many, many years. When the company instead chose the cheaper digital approach, they sent its logo to an industrial shop that used an enormous inkjet printer, which lays the lettering onto heavy PVC vinyl, the way your computer tells your printer to make a color image. The shop then adds grommets, and the sign is ready to be hung. The useful life of such a banner, depending on the weight of the vinyl and the quality of the colors and ink, is three to five years. Sign painter Jeff Canham, who apprenticed at New Bohemia, specializes in clean, straight lettering. One of the few places where someone can still learn to paint signs the old way is at San Francisco’s New Bohemia sign shop, which has become the epicenter for sign painting’s revival. Inside, among a wall covered with signs, one reads “Simulate a more vernacular feel,” a knowing wink at the inauthenticity of creating new things that look old. New Bohemia acknowledges using making some use of a computer, typically for fonts. “We’re treading a digital/analogue divide here,” says Damon Styer, its current owner. “It’s not just about good design and nice hand-lettering, but making signs fast enough to stay in business.” (Styer often begins with pencil sketches, which he then scans and “vectorizes” on a computer, printing out enlarged sections of the sign that he then uses for pounce patterns.) But there is still plenty of analogue going on here. On the day I visited, one apprentice spent the entire time practicing letters on a wall, over and over. When Styer took over the business, he thought chances were good that it wouldn’t succeed; instead, it has expanded rapidly. “Over the last seven years, it hasn’t slowed down, we’re constantly busy,” he says. Jeff Canham painted this classic storefront sign for The Annex, an art supplies store near the Pacific Ocean, in San Francisco’s Sunset District. With few trade schools or mentors to rely on, the new generation of sign painters have started organizing their own communities. As is often the case, technology has entered the picture to both ruin things and save the day. Thanks to social media, these painters have been able to find each other and share techniques. Several of their shops, including New Bohemia and Mystic Blue, now offer classes in lettering. A group called the Letterheads started in Colorado in the 70s as a gathering place for sign painters to share the design principles and techniques that were no longer taught in trade schools; it has since grown internationally, producing SignCraft magazine and a website with resources (where do you find gold leaf?). Letterheads also holds regional and annual meetings. The Pre-Vinylite society, started by Meredith Kasabian of Boston’s Best-Dressed Signs, is another virtual meeting place for sign painters, which maintains a blog and is soon starting a journal on the subject. Sign painter Jeff Canham, an avid surfer, painted the iconic signage for Mollusk Surf Shop and other independent businesses near his studio in the Sunset neighborhood of San Francisco. Since I met Bob Dewhurst, I’ve begun looking at signs differently. Walking around town, I now notice the ones that are hand-painted, and admire the detail and skill. If nothing else, the signs send a message that the proprietors care about aesthetics, and how their brands contribute to the cityscape. Now that I notice them, hand-painted signs do seem less anonymous than vinyl or digital versions; and with them, so does my city. When I finished my visit with Bob Dewhurst, he gave me a hug. Before I left, he handed me a wooden heart, hand-painted words in shadowed cursive with spots of yellow: “Thank you.” If it had been a print-out, I would have smiled and thrown it away later. Instead, I hung it in my office, where it reminds me, among other things, to be grateful to all those invisible sign painters who have given our urban landscapes more lasting character and charm. Andrew Sullivan has worked as a photographer for The New York Times and The Wall Street Journal. He is now based in San Miguel de Allende, Mexico. –Sign Painters, the movie and book, by Faythe Levine and Sam Macon. –The Pre-Vinylite Society, manifesto, journal, blog, and art exhibits of hand-painted signs. –How-to books on sign painting skills, published by Beard & Butter. –Center for the Lettering Arts, resources for sign painting, calligraphy, and graphic arts. –Sign Graphics Class at Los Angeles Trade Tech. -“How to Paint Signs and Influence People” sign-painting zines, by Colt Bowden.